Yet none of this has stopped paleoclimataologists from making bold claims using tree ring data. In particular, since 2000, a large number of peer-reviewed climate papers have incorporated data from trees at the Yamal Peninsula in Siberia. This dataset gained favour, curiously superseding a newer and larger data set from nearby. The older Yamal trees indicated pronounced and dramatic uptick in temperatures. How could this be? Scientists have ensured much of the measurement data used in the reconstructions remains a secret - failing to fulfill procedures to archive the raw data. Without the raw data, other scientists could not reproduce the results. The most prestigious peer reviewed journals, including Nature and Science, were reluctant to demand the data from contributors. Until now, that is. At the insistence of editors of the Royal Society's Philosophical Transactions B the data has leaked into the open - and Yamal's mystery is no more. 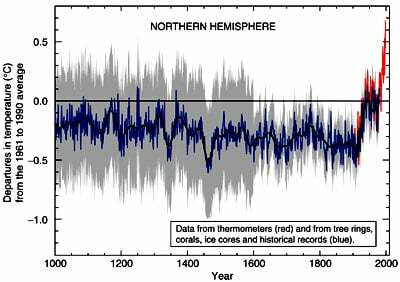 Controversy has been raging since 1995, when an explosive paper by Keith Briffa at the Climate Research Unit at the University of East Anglia asserted that that the medieval warm period was actually really cold, and recent warming is unusually warm. Both archaeology and the historical accounts, Briffa was declaring, were bunk. Briffa relied on just three cores from Siberia to demonstrate this. Three years later Nature published a paper by Mann, Bradley and Hughes based on temperature reconstructions which showed something similar: warmer now, cooler then. With Briffa and Mann as chapter editors of the UN's Intergovernmental Panel on Climate Change (IPCC), this distinctive pattern became emblematic - the "Logo of Global Warming". 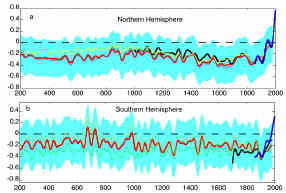 Tree data was secondary in importance to Mann's statistical technique, which would produce a dramatic modern upturn in temperatures - which became nicknamed the "Hockey Stick" - even using red noise. Similarly, all the papers that used the Yamal data have the same point to make. All suggest recent dramatic warming. Having scored a global hit with a combination of flawed statistics and dubious dendrochronology, the acts repeated the formula. "Late 20th century warmth is unprecedented for at least roughly the past two millennia for the Northern Hemisphere," wrote the two authors of Global Surface Temperatures over the Past Two Millennia published in Geophysical Research Letters in 2003 - Mann, and Phil Jones of CRU. For example, Briffa's 2008 paper concludes that: "The extent of recent widespread warming across northwest Eurasia, with respect to 100- to 200-year trends, is unprecedented in the last 2000 years." It continues to this day. A study purporting to show the Arctic was warmer now than for 2,000 years received front-page attention last month. Led by Northern Arizona University professor Darrell S Kaufman, and including dendro veteran Mann, this too relied heavily on Yamal, and produced the signature shape. A comparison of Yamal RCS chronologies. red - as archived with 12 picked cores; black - including Schweingruber's Khadyta River, Yamal (russ035w) archive and excluding 12 picked cores. Both smoothed with 21-year gaussian smooth. y-axis is in dimensionless chronology units centered on 1 (as are subsequent graphs (but represent age-adjusted ring width). "The majority of these trees (like the Graybill bristlecones) have a prolonged growth pulse (for whatever reason) starting in the 19th century," wrote Canadian mathematician Steve McIntyre on his blog on Sunday. "When a one-size fits all age profile is applied to these particular tries, the relatively vigorous growth becomes monster growth - 8 sigma anomalies in some of them." McIntyre's determination to reproduce the reconstructions has resulted in the Yamal data finally coming to light. The scandal has serious implications for public trust in science. The IPCC's mission is to reflect the science, not create it. As the panel states, its duty is "assessing the scientific, technical and socioeconomic information relevant for the understanding of the risk of human-induced climate change. It does not carry out new research nor does it monitor climate-related data." But as lead author, Briffa was a key contributor in shaping (no pun intended) the assessment. When the IPCC was alerted to peer-reviewed research that refuted the idea, it declined to include it. This leads to the more general, and more serious issue: what happens when peer-review fails - as it did here?